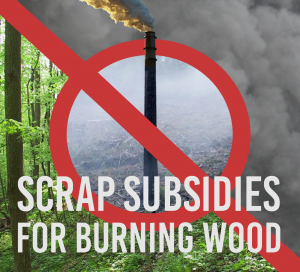 Recently the government effectively ended future subsidy for burning wood for electricity, sending the clear message that this is no longer considered part of the solution to climate change. If you are an MP, please help us to call for existing Renewable Obligation subsidies to be redirected from biomass burning towards renewable, low-carbon solar, wave and wind power by signing the Open Letter and/or EDM 1771. This will not only save millions of pounds to be invested in genuinely renewable wind, wave and solar energy but will also help the UK to meet our international climate commitments. Please sign the Open Letter below by emailing biofuelwatch[at]gmail.com. If you can sign EDMs, please sign EDM 1771 which you can read below. Please write to Secretary of State Greg Clark and Energy Minister Claire Perry and urge them to redirect subsidies for biomass electricity to wind, solar and wave power instead. If you are not an MP, please contact your MP via our alert page HERE. For a fully referenced version of the letter, please see Open Letter calling on the Government to end Renewable Obligation Certificate Subsidies (ROCs) for electricity generated from biomass. In September 2018, the government announced changes to Contracts for Difference which will effectively rule out new subsidies for large-scale import-dependent biomass electricity. This is a very positive development and sends a strong message that biomass burning is not part of the solution to climate change. However, the changes to the subsidies rules only apply to new projects. Existing biomass power stations are due to continue receiving subsidies until 2027 which were previously granted under the Renewable Obligation. This means that billions of pounds of renewable energy funding, raised through utility bills, will be spent on energy which is neither clean nor low-carbon in the coming years. In 2017, biomass-burning power stations received around £1 billion in renewable subsidies, more than £38 per household on average, and the annual figure is set to rise. Last year, £797 million was granted as part of the Renewable Obligation, with the rest coming from a Contract for Difference for Drax. It has been shown that biomass burning accelerates climate change, damages forests and biodiversity and pollutes communities in source countries and at home. As elected representatives of our communities, we the undersigned believe we have a responsibility to act on climate change and to ensure that the UK can meet our international climate commitments to keep global temperature rises to 1.5C. In the light of the recent UN IPCC report, it is vital that we urgently halt deforestation and phase out fossil fuels in order to prevent irreversible climate change. Subsidies granted under the Renewable Obligation Certificates or ROCs, can be easily removed through ‘secondary legislation’. This would free up hundreds of millions a year which, under the Levy Control Framework, must then be spent on genuinely low-carbon, clean renewables. b. Ensure that the money saved is used to increase support for wind, solar and wave/tidal power under the Levy Control Framework. Furthermore, subsidies for energy efficiency and conservation should also be increased. For a fully referenced version of the EDM, please see References for EDM 1771. That this House expresses its concern that renewable energy subsidies for electricity generated from biomass, most of which is generated using imported wood pellets, are resulting in energy bill-payers paying for expensive, high-carbon electricity; notes that burning wood to generate electricity is a high-carbon power source; notes that biomass damages forests and biodiversity, pollutes communities in source countries and and at the point of generation and worsens climate change; notes the recent warning by the IPCC that substantial progress on comprehensive decarbonisation of the economy must be made in just a dozen years if we are to avoid catastrophic damage to the climate; notes that more than £1 billion in biomass subsidies were paid out in 2017 amounting to more than £38 per household on average; believes that government should follow the logic of its recent decision effectively to end new subsidy for large-scale import-dependent biomass under Contracts for Difference and should remove subsidy already granted for biomass under the Renewable Obligation (ROCs) scheme; and further calls on the Government to instead direct funding towards renewable, low-carbon electricity sources including solar and wind.